This post is part of a series of posts on ETL Instrumentation. 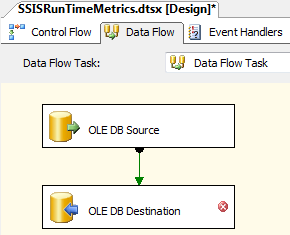 In Part 1 we built a database to hold collected SSIS run time metrics and an SSIS package to deomnstrate how and why we would load metrics into the database. In Part 2 we expanded on our database and the SSIS package to annotate version metadata, manage error metrics capture, and task status reporting. In Part 3, we start using the ETL Instrumentation infrastructure we’ve built to measure some actual ETL. We now have the concepts – it’s time to put them to work! 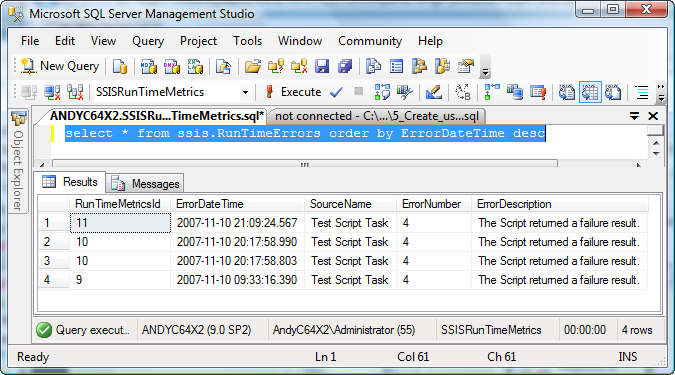 – a table named ssis.RunTimeMetrics. – a table named ssis.RunTimeErrors. 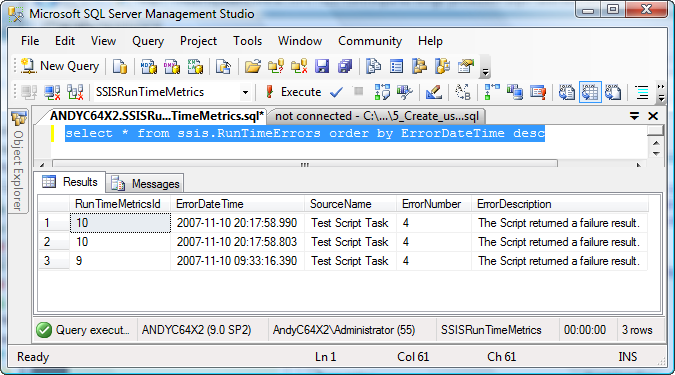 – a table named ssis.TaskMetrics. – a stored procedure named ssis.usp_RecordPackageStart. – a stored procedure named ssis.usp_RecordPackageEnd. – a stored procedure named ssis.usp_RecordPackageError. – a stored procedure named ssis.usp_RecordTaskStart. – a stored procedure named ssis.usp_RecordTaskEnd. We expanded the types of run-time data we are collecting. Part 1 introduced Status collection, in Part 2 we added Exception collection. We also introduced scope into both types of collection, recording Exception information on error and finalizing Status (reporting that an error occurred). At the beginning of SSIS package execution, we call ssis.usp_RecordPackageStart from an Execute SQL Task. We pass the package start date and time, the package name, and the package version. We also pass in a status of “Started”. From this stored procedure we get the ID of the newly created row, which we then push into a Package Load ID variable (iPackageLoadID). At the beginning of a task or collection of tasks that define a process, we call ssis.usp_RecordTaskStart from an Execute SQL Task. We pass the task or process start date and time, the task (source) name, iPackageLoadID, and a status of “Started”. From this stored procedure we get the ID of the newly created row, which we then push into a Task Load ID variable (iTaskLoadID). 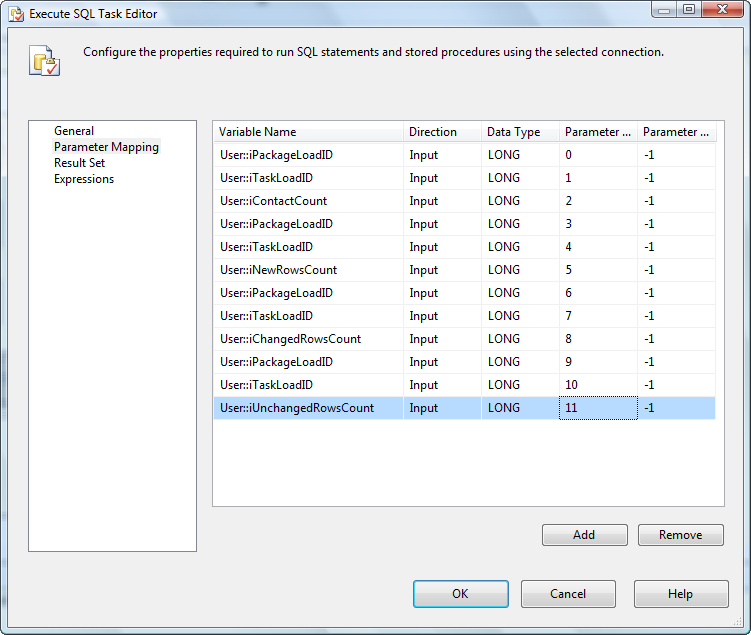 When the task completes, we call ssis.usp_RecordTaskEnd from an Execute SQL Task. 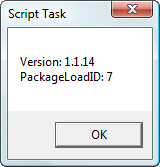 We pass in the Task Load ID from the iTaskLoadID variable, the current date and time, and the status “Succeeded”. On error, we capture Exception data and record an Error Status – both are crucial to knowing what happens when an exception is thrown. When the package completes execution, we call ssis.usp_RecordPackageEnd from an Execute SQL Task. We pass in the Package Load ID from the variable, the current date and time, and the status “Succeeded”. This is a major revision – we’re moving to version 2.0 and resetting the VersionBuild property. I also add text to the VersionComments property. Now we’re ready to make some code changes. Click the Parameter Mapping page and click the Add button. 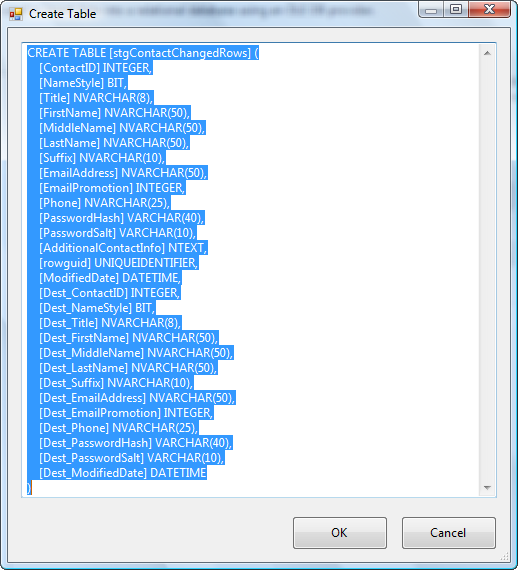 Set the Variable Name to System::TaskName, change the Data Type to VarChar, and the Parameter Name to 1. 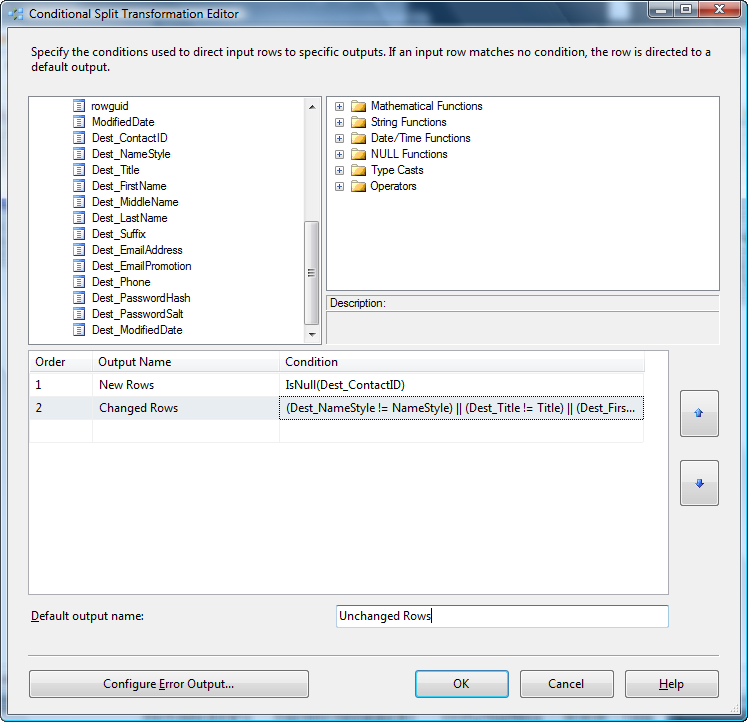 Double-click the Data Flow Task to open the editor. 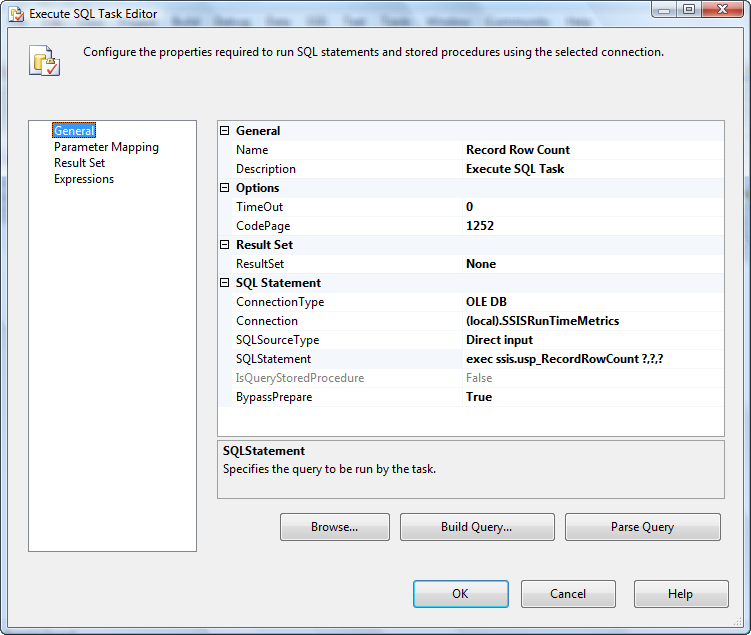 Drag an OLE DB Source Adapter onto the Data Flow Task canvas and double-click it to open the editor. 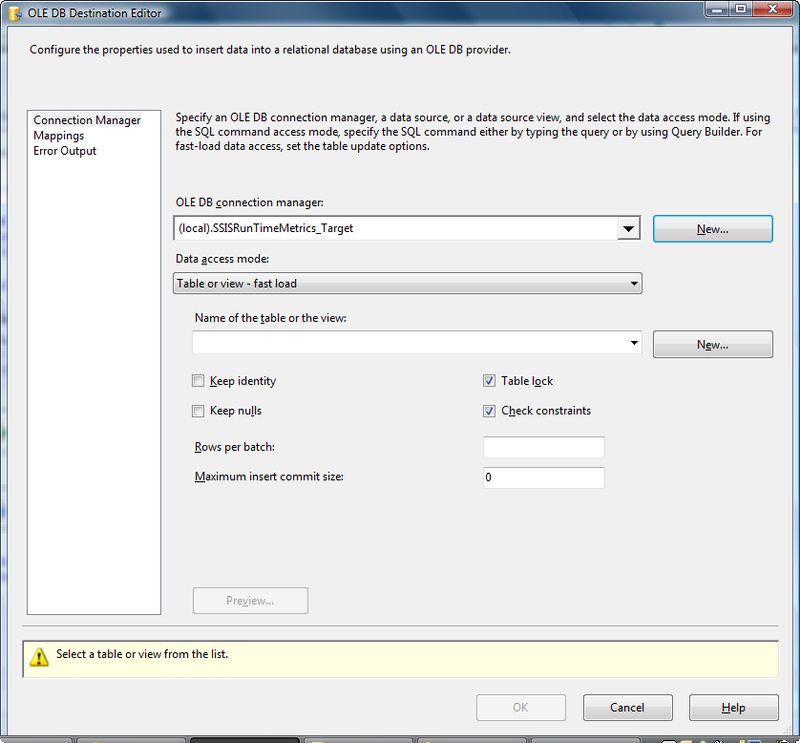 Click the New button beside the OLE DB connection manager to open the Configure OLE DB Connection Manager dialog. Click the New button to open the Connection Manager dialog. Enter “(local)” in the Server name dropdown box. In the “Select or enter a database name” dropdown, select AdventureWorks. You can download SQL Server 2005 Samples and Sample Databases if you don’t already have them installed. Click the OK button to close the Connection Manager dialog. 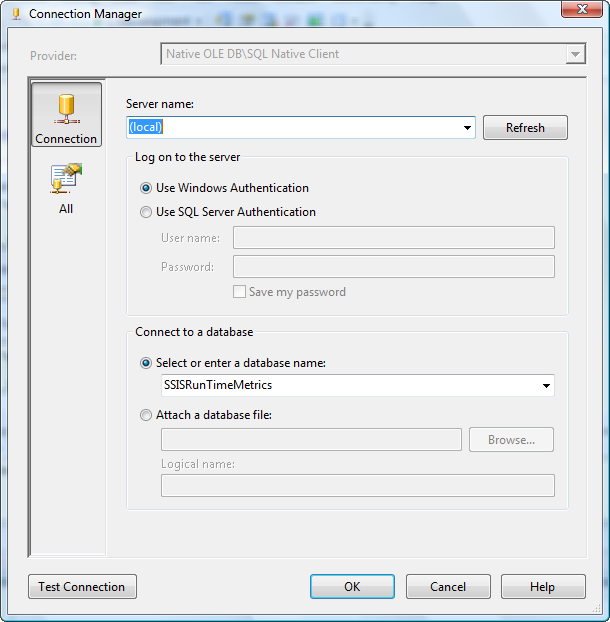 Click the OK button again to close the Configure OLE DB Connection Manager dialog. 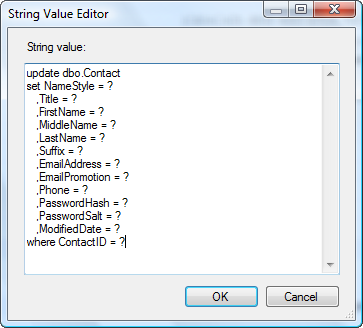 Select “Person.Contact” from the “Name of the table or the view” dropdown and click the OK button to close the OLE DB Source Editor. Drag an OLE DB Destination Adapter onto the Data Flow canvas and connect it to the OLE DB Source Adapter. Click the OK button. Click the Mappings page and then the Ok button to close the editor. The left outer join to the RunTimeErrors table allows us to view successful executions. Chnaging the Where clause to bring back the latest id value from the RunTimeMetrics table will prove useful when we add tasks. 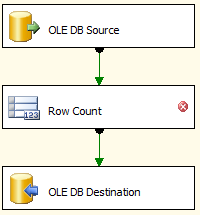 On the Data Flow Task, delete the data flow path between the OLE DB Source Adapter and OLE DB Destination Adapter. Drag a Row Count Tranformation from the Toolbox onto the Data Flow canvas and connect it between the OLE DB Source and OLE DB Destination Adapters. Click SSIS, Variables and create a new package-scoped Int32 variable named iContactCount. Double-click the Row Count transformation to open the editor. Click the VariableName dropdown and select the User::iContactCount variable to hold the record counts. 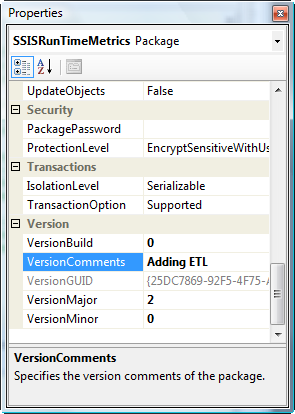 There are different ways (methodologies) to instrument an ETL SSIS package. 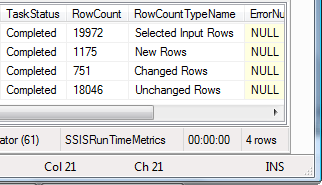 Some designers choose to place the code to insert row counts – as well as the code to store start and end metrics we capture in the ssis.TaskMetrics table – on the Control Flow. Other choose to use Event Handlers – OnPreExecute and OnPostExecute – to house the logic performing these operations. There are sound reasons for choosing each method. An argument for using Event Handlers is it provides a separation of the ETL logic and metrics / status logic. An argument for not using Event Handlers is all the logic is readily accessible on the Control Flow and Data Flow. Both arguments are legitimate and the customer’s maintenance needs and SSIS experience should be considered in this design decision. For the purposes of this series, I choose to have most of the logic visible on the Control Flow and Data Flow. 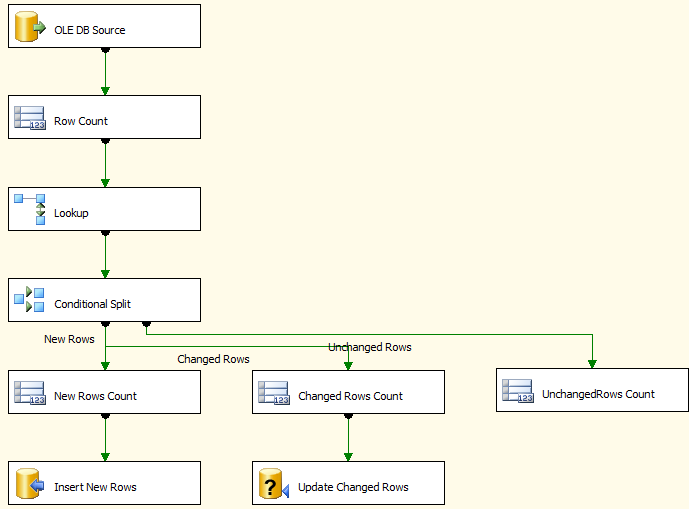 Return to the Control Flow to add a mechanism to insert the RowCount data into our new table. 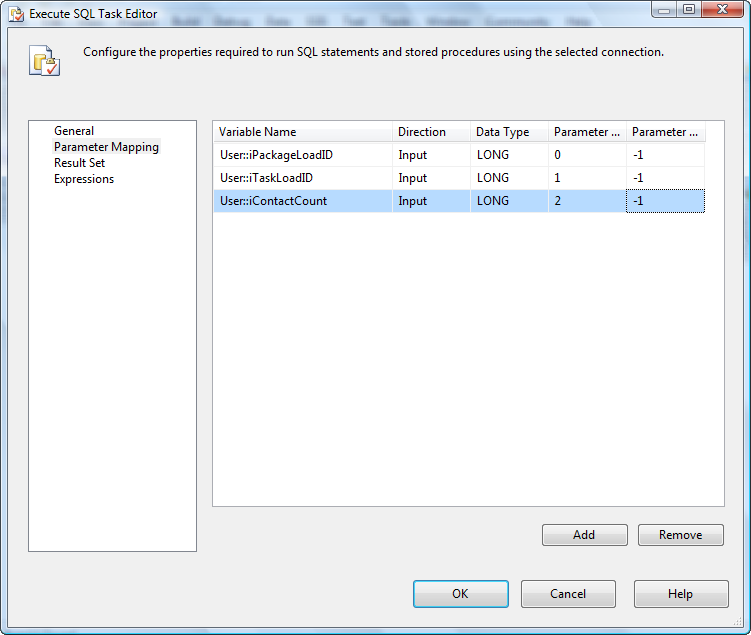 Drag an Execute SQL Task into the “Step 1 – Load Contact” Sequence Container. Connect a Success Precendence Constraint from the “Log Successful End of Task” Execute SQL Task to the new Execute SQL Task. 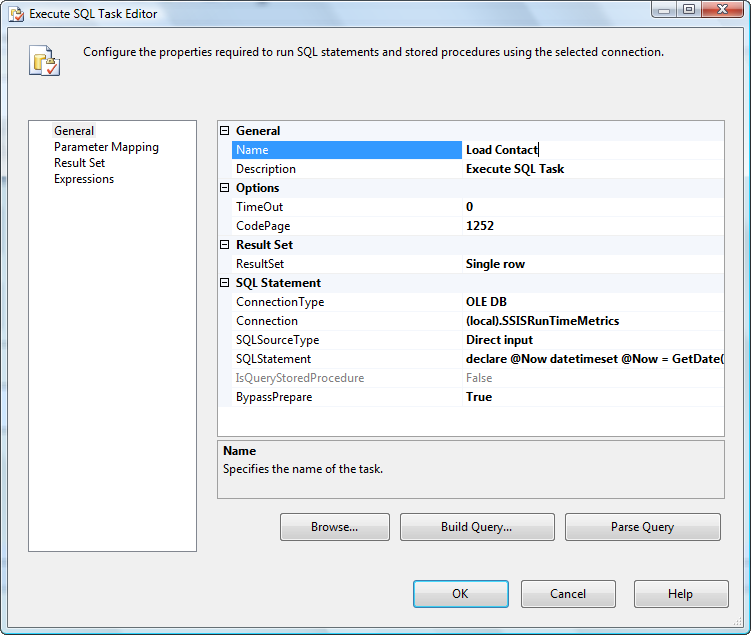 Click the OK button to close the Execute SQL Task editor. We get all the rows this execution – cool. First return to the Control Flow. Click anywhere in the Control Flow canvas where there is white space. This sets focus to the Control Flow, which sets focus to the Package level. 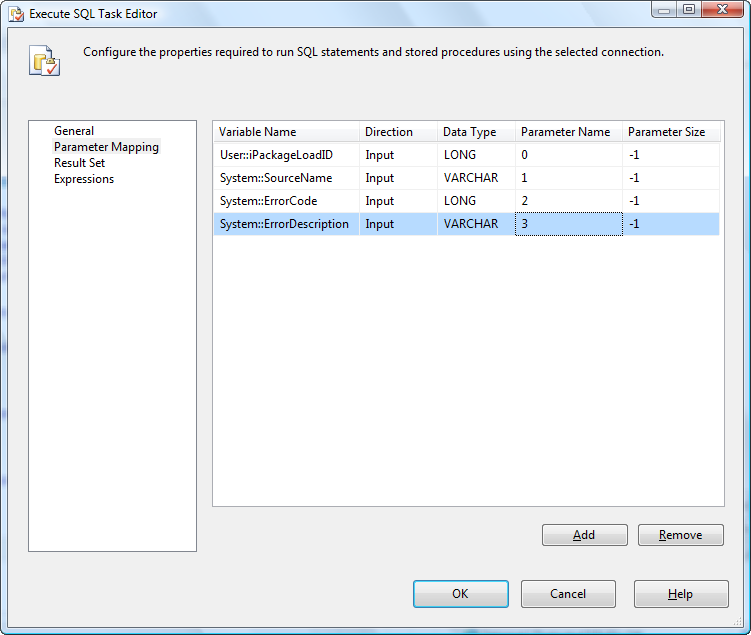 Click SSIS, Variables to display the Variables dialog. Add three package-scoped Int32 variables named iNewRowsCount, iChangedRowsCount, and iUnchangedRowsCount. 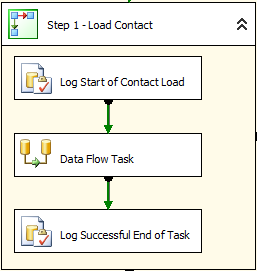 Click the Data Flow tab and drag an OLE DB Command, Lookup, and Conditional Split transformations onto the Data Flow Task. 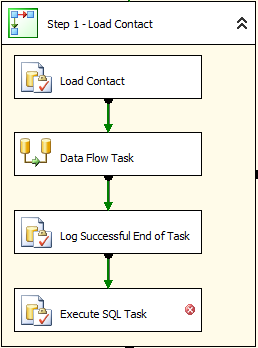 Also drag three Row Count transformations onto the Data Flow. Click the Columns tab. Right-click in the mappings area and click “Select All Mappings”. Right-click in the mappings area again and click “Delete Selected Mappings”. 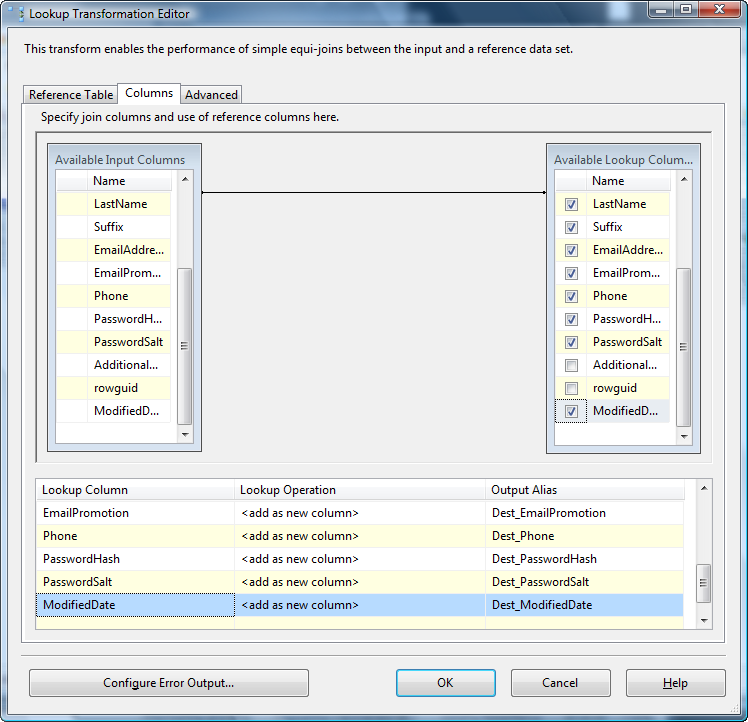 Drag ContactID from the Available Input Columns and drop it on the Available Lookup Columns’ ContactID column. Click the Configure Error Output button and change the Lookup Output Error dropdown from “Fail component” to “Ignore failure”. This changes the default behavior of the Loopup operation from an Inner Join to a Left Outer Join. Click the OK button to close the Lookup editor. Connect the output of the Lookup transformation to the input of the Conditional Split transformation and double-click the Conditional Split to open the editor. Name the first Output “New Rows” and set the Condition to “IsNull(Dest_ContactID)”. Name the second Output “Changed Rows” and set the Condition to “(IsNull(Dest_NameStyle) ? True : Dest_NameStyle) != (IsNull(NameStyle) ? True : NameStyle) || (IsNull(Dest_Title) ? “null” : Dest_Title) != (IsNull(Title) ? “null” : Title) || (IsNull(Dest_FirstName) ? “null” : Dest_FirstName) != (IsNull(FirstName) ? “null” : FirstName) || (IsNull(Dest_MiddleName) ? “null” : Dest_MiddleName) != (IsNull(MiddleName) ? “null” : MiddleName) || (IsNull(Dest_LastName) ? “null” : Dest_LastName) != (IsNull(LastName) ? “null” : LastName) || (IsNull(Dest_Suffix) ? “null” : Dest_Suffix) != (IsNull(Suffix) ? “null” : Suffix) || (IsNull(Dest_EmailAddress) ? “null” : Dest_EmailAddress) != (IsNull(EmailAddress) ? “null” : EmailAddress) || (IsNull(Dest_EmailPromotion) ? -1 : Dest_EmailPromotion) != (IsNull(EmailPromotion) ? -1 : EmailPromotion) || (IsNull(Dest_Phone) ? “null” : Dest_Phone) != (IsNull(Phone) ? “null” : Phone) || (IsNull(Dest_PasswordHash) ? “null” : Dest_PasswordHash) != (IsNull(PasswordHash) ? “null” : PasswordHash) || (IsNull(Dest_PasswordSalt) ? “null” : Dest_PasswordSalt) != (IsNull(PasswordSalt) ? “null” : PasswordSalt) || (IsNull(Dest_ModifiedDate) ? (DT_DBDATE)”1/1/1901″ : Dest_ModifiedDate) != (IsNull(ModifiedDate) ? (DT_DBDATE)”1/1/1901″ : ModifiedDate)”. Change the Default Output Name to “Unchanged Rows”. Drag an output from the Conditional Split to one of the Row Count transformations. When prompted, select the New Rows output from the Conditional Split transformation. Rename this Row Count “New Rows Count” and double-click it to open the editor. Set the VariableName property to User::iNewRowsCount and click the OK button to close the editor. Connect the output of the New Rows Count transformation to the OLE DB Destination Adapter “Insert New Rows”. Drag a second output from the Conditional Split to another Row Count transformation. When prompted, select the Changed Rows output. Rename the Row Count transformation “Changed Rows Count” and double-click the Row Count transformation to open the editor. Set the VariableName property to iChangedRowsCount and click the OK button to close the editor. Double-click the OLE DB Command transformation to open the advanced editor. Set the Connection Manager property to “(local).SSISRunTimeMetrics_Target”. Connect the remaining Conditional Split output (Unchanged Rows) to the remaining Row Count transformation. Rename the Row Count “Unchanged Rows Count”, double-click it to open the editor, and set the VariableName to User::iUnchangedRowCount. Before we leave the Data Flow, let’s optimize it for performance. There’s a couple good reasons for this, one big reason is the current design may very well result in blocking, maybe even deadlocks! Click the OK button to create the new table, then click the Mappings page to complete configuration. Click the OK buton to close the editor. This converts the RBAR (Row-By-Agonizing-Row) update statement in the OLE DB Command to a set-based update. Much better. Finally, let’s update the “Record Row Count” SQLStatement.While we’re in there, let’s add the inserts for the additional row count variables. 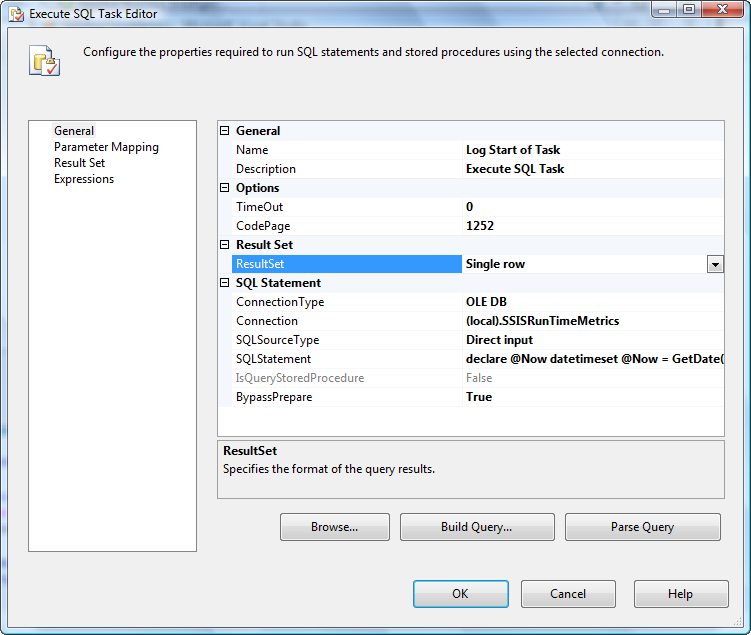 Return to the Control Flow and double-click the “Record Row Count” Execute SQL Task to open the editor. 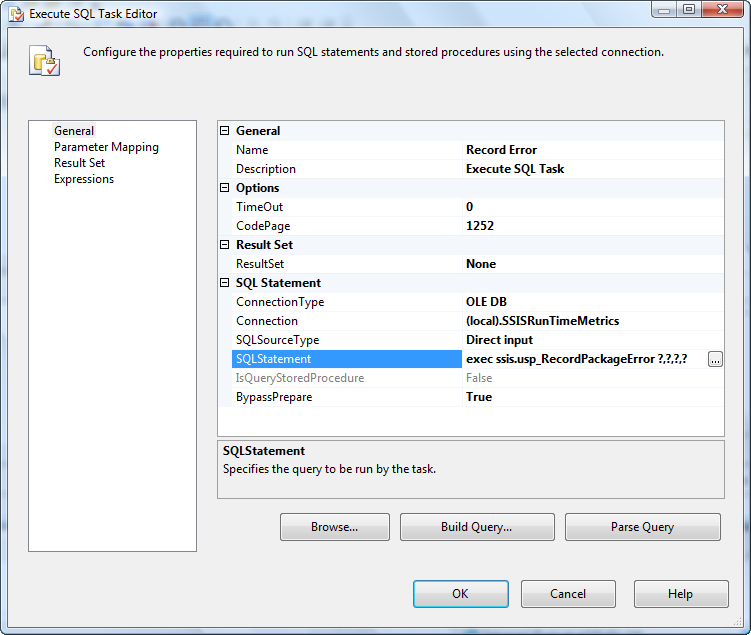 Note every third parameter is a count measurement, the order indicated by the SQLStatement property. Click the OK button to close the editor and execute the package. Execute the package again and observe the Data Flow. Now this is starting to look like SSIS ETL! I’d say that settles it. PS – The PASS Summit 2015 Call for Speakers closes at 9:00 PM PDT Sunday, 15 Mar 2015 (04:00 GMT 16 Mar 2015). There’s still time, but hurry! New Public SQL Server 2008 CTP (Almost) Available! The new SQL Server 2008 (Katmai) CTP is now available for public consumption! 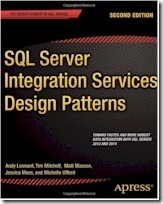 The next CTP of SQL Server 2008 promises to have Intellisense functionality! 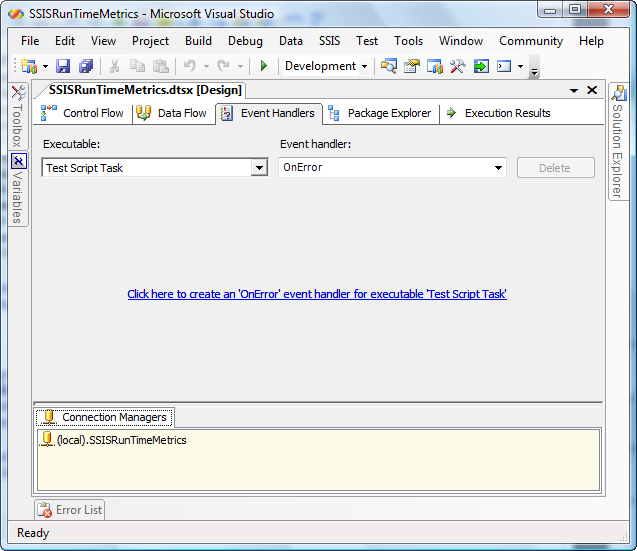 You can find SSIS 2005 Custom Tasks and Component Samples at CodePlex. 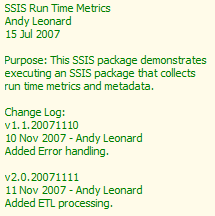 At the same location you can find SSIS 2008 samples. How cool is that? The samples include source code in VB.Net and C#. 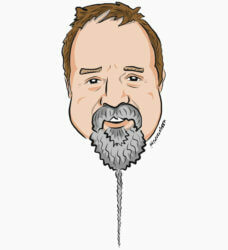 They serve as a decent starting place for developing your own SSIS custom tasks and components. Free registration to CodePlex is required to access the samples. Steve Rowe has an excellent post on why we should revisit process and procedure from time to time. In Part 2 we will expand on our database and the SSIS package to annotate version metadata, manage error metrics capture, and task status reporting. Let’s start by opening the SSIS package we built in Part 1. 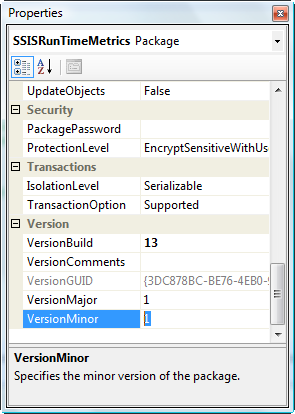 The first thing we want to change is the package metadata – the data in our SSIS package about our SSIS package. Why? We always want to know what changes were made, who made the changes, and when they were made. A version number in the format Major.Minor.Date. The name of the developer who made the change. A brief description of the change. Now I’m ready to actually make changes! 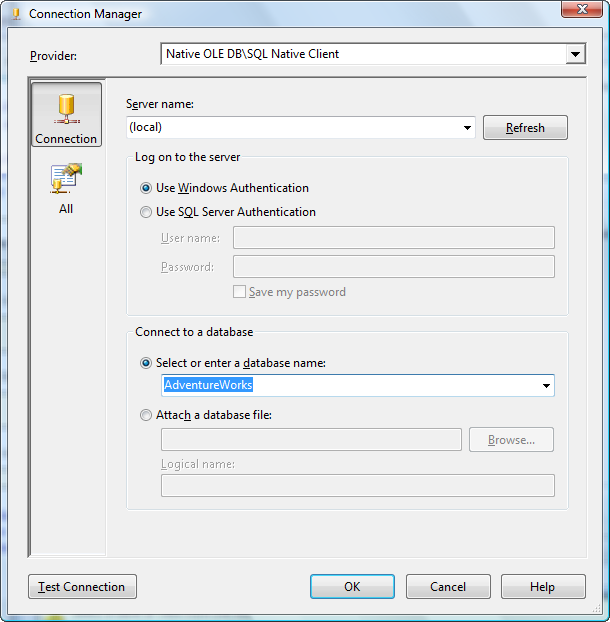 To facilitate package execution on your machine, I want to edit the name and target SQL Server instance of the OLEDB Connection Manager. Double-click the connection manager to edit it and change the Server name property to “(local)”. Unit test successful – ready to continue developing. Our current solution works well as long as our SSIS package succeeds. And this is the way all good engineering is done; Use Case 1 should always be “Everything Succeeds”. 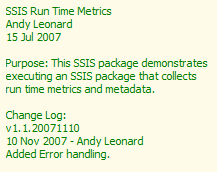 But what happens if the SSIS package fails? Shouldn’t we record the failure and as much metadata about the failure as possible? I’m glad you asked: Yes, we should. 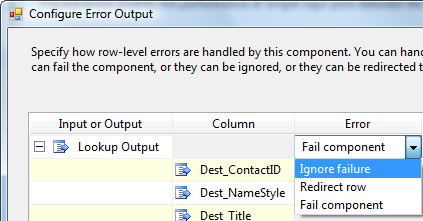 In SSIS, errors “bubble”. The concept of bubbling is familiar to ASP developers – it simply means events follow a prescribed path through the scope hierarchy of the application. Ok, you can scratch the word “simply” out of the preceeding sentence. This isn’t a very descriptive error message. 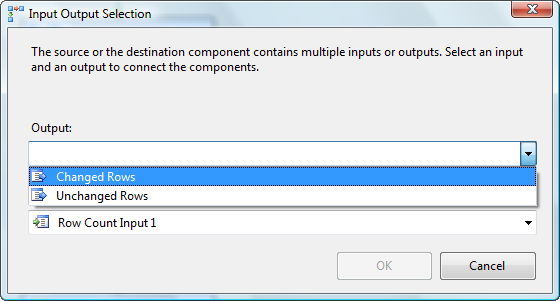 Some SSIS error messages aren’t very descriptive. Let’s add some error logging capabilities to our ETL Instrumentation application. There are lots of ways to develop solutions with SSIS. Some of them are best practices, more are simply matters of coding style. For instance, here you could build the database table to hold error information first; or you could build the error-handling functionality in the SSIS package first. This is a style decision. I choose to build the table first. RunTimeMetricsID – to map the error to the execution instance. I want to know the error occurred when I executed the package at a certain time. ErrorDateTime – when the error actually occurred. SourceName – the task that raised the error. ErrorNumber – the error number. ErrorDescription – the error description. Note this script is re-runnable. I encourage you to take the time to write re-runnable scripts when developing database solutions. Again, re-runnable code. 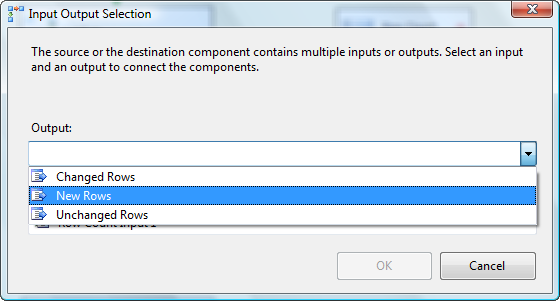 Now lets’ return to Visual Studio to populate our table with error information. 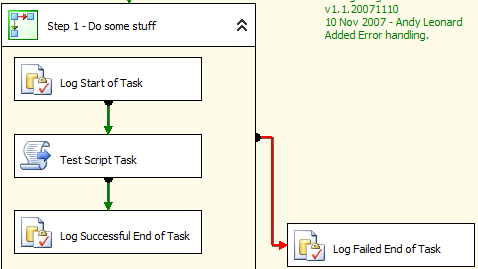 Click on the Test Script Task on the Control Flow. Then click the Event Handlers tab. Because you clicked the Test Script Task first, the Event Handler Executable defaults to the Test Script Task. The Event Handler defaults to the OnError event. To create the OnError Event Handler, click the link labeled “Click here to create an ‘OnError’ event handler for executable ‘Test Script Task'”. Let’s do that now. After you click the link you will note the canvas looks remarkably familiar: it’s nearly identical to the Control Flow. Click the Parameter Mapping page. Parameterized queries use question marks (?) as parameter placeholders. There are a few ways to access the parameters (a subject for another blog post). We will use ordinal position to access them. Click the Add button to add a new parameter. Set the Variable Name property to “User::iPackageLoadID” and the Parameter Name property to “0”. 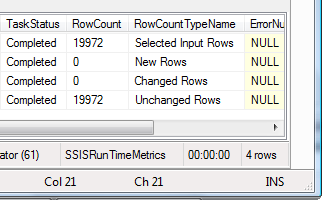 The default data type (“Long”) works for SSIS integer data type variables. This maps the iPackageLoadID variable to the first question mark in our SQLStatement property, which is the @RunTimeMetricsID parameter for the stroed procedure. Got it? Good. Click the OK button to close the editor and execute the package. We now have basic error information from our failed task. 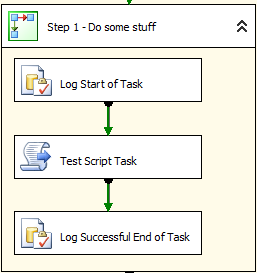 This is great for our Test Script Task, but what about the other tasks on our SSIS package? Do we have to create OnError event handlers for them as well? That could be a lot of work. Select the OnError event handler and click the link to create the OnError event handler. 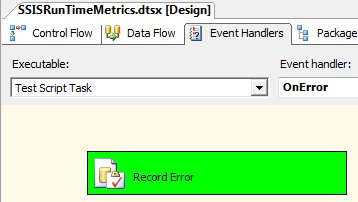 Then paste the “Record Error” Execute SQL Task onto the new OnError event handler canvas. Re-execute the package observing the new OnError event handler. 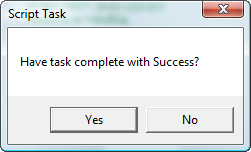 Click the No button to cause the Test Script Task to fail. Note the subsequent execution (RunTimeMetricsID 10, in my case) records the error twice. Hmmm… this is not the desired behavior. I only want the error to show up once per instance. However, also note the information recorded is nearly identical – only the date is different (and then only by 183 milliseconds). So the 20:17:58.803 occurrence of the error is from the Test Script Task and the 20:17:58.990 occurrence is the same error bubbling into the “Step 1 – Do some stuff” Sequence Container’s context and firing an identicaly-configured OnError event handler. Again, this is not the desired behavior but it gives me an idea: Since I know errors bubble up the object model, all errors should eventually make it to the Package level. 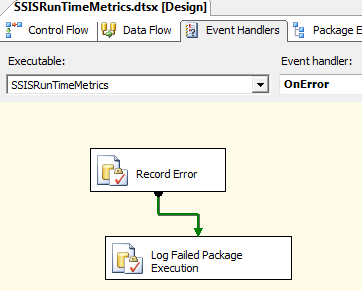 If I delete my existing OnError event handlers and create a single OnError event handler at the package level, I should then be able to record any and all errors – no matter where they occur in the SSIS package. Click the OK button to close the editor. Note the SourceName column contains the name of the task where the error originates, even though the error has bubbled through two layers of object model. This also holds for the ErrorNumber and ErrorDescription fields. It’s helpful to be able to track performance at a granular level. 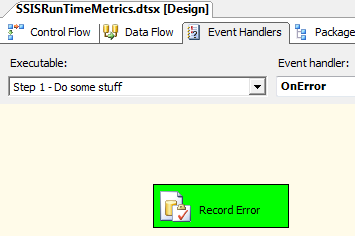 When instrumenting an ETL process, I like to record additional (and different) metadata at the Task level. We will use the new procedures to instrument the task. Click the OK button to close the editor. Next, let’s create a way to update TaskMetrics table after a successful execution. Note TaskMetricsID 2 completed while TaskMetricsID 1 started and then stopped. This makes a fine source query for a SQL Server Reporting Services solution! In this second part of ETL Instrumentation, we modified version metadata to indicate we have made changes; added package error logging and error status logging; and added task status logging. Willie “Pops” Stargell started my interest in photography (…a funny way to start a post on a SQL Server blog site, but bear with me). Pops Stargell led the 1979 Pittsburgh Pirates to win the World Series. He was the MVP that year as well. My Mom, in the only time I ever remember her gambling when I was a kid, bought a $10 spot in a World Series baseball pool that year. The pool was based on the 1’s digit of the total runs scored by the Pirates and Orioles in the entire series with the person who had the 1’s digits in the correct order winning $600, the person getting them in reverse order winning $300, and the organizer kept $100. The series lasted seven games that year. Mom was set to win the $600 if the final score of Game 7 was 4-1 in the Pirate’s favor. Willie Stargell hit a home run that helped achieve that score, along with some good fielding (especially for a 39-year old player). I had a budding interest in photography because some friends at high school were photographers. There was just no way we could swing $200 for a mid-range 35mm SLR back them. But Mom promised me if she won the big money she’d buy me the camera. She won and she bought me the camera. I got to attend an interesting Yearbook Seminar the next summer held at Longwood University in Farmville, VA – located about 7 miles from where I currently live. I learned some fascinating things about photography and did a decent job getting shots for my senior year yearbook. One of the things I learned was this: If you take an out-of-focus shot, there’s nothing you can do in chemical and light processing to bring that shot into focus. There may be (and probably are) digital things we can do nowadays, but this was the 70’s. The very best you could do with an out-of-focus was produce a print no less in focus. In the context of the photograph, the focus attribute was set when the picture was taken. The focus could not be improved after the picture was taken. It was the best it was ever going to be from that moment until forever. Now here’s a lesson we can take into database development. Several for-instances leap to mind: granular resolution in a business intelligence data acquisition system, for one. Imagine you are tasked with reporting real-time data for a business intelligence scorecard application. The client expects up-to-the-second updates from the data acquisition systems on the manufacturing floor and this is a project requirement. Unless data is collected every five seconds on the floor. Then you have an issue. There’s nothing you can do from your side of the project – since you merely read, store, transform, and display the acquired data – to “fix” this. You can give updates every second, but these counters (and metrics derived from them) will change only every five seconds. In this imaginary scenario you cannot “re-focus” the picture. The best you can do is present the information at it’s current grain – and no finer. The same can be said for software development. I will state it in another way: Every decision to develop Feature A in a certain way is also a decision to not develop Feature A in any number of other ways. There are consequences to choosing an approach, methodology, or context. These consequences are usually discovered well down the path towards a deliverable or release. Occassionally, talented developers can find a “silver bullet” – a fix that solves the current consequence to a past decision without breaking anything else. But this is unfortunately rare. Usually there are consequences to the consequence-initiated fix, and so on, ad infinitum. There is a point early on in a development project where such consequences, if detected, can be addressed with relatively little effort. I use the analogy of deflecting an approaching asteroid: If you detect it early enough you can deflect it with a BB. Wait, and all the nukes on the planet won’t stop it. One rule of processes – I first saw this in The Goal – is “Losses accumulate, gains do not” (just call me Mr. Encouraging). Most good process measurement methodologies account for this. One way to think about it is to consider the example of a three-stage linear process where each stage is running at 90% efficiency. <TrickQuestion> What is the overall efficiency of the system? 90% is incorrect. It’s a linear process. The output of stage 1 is 90%. The output of stage 2 is 90% of 90%, or 81%. The output of stage 3 is 90% of 81%, or 73%. Why Are You Sharing This, Mr. Encouraging? There are a few reasons: First, this is a trap into which many a young developer falls. It looks simple but it is not. Life is filled with things that appear deceptively simple. Software development is but one of them. Second, underestimating the effort required to accomplish any software related task is a trait shared by every good developer I know, plus me. We all think things will take less time than they do. I don’t know why, but that doesn’t make the fact any less true. Joel Spolsky has an excellent article on Evidence Based Scheduling that presents an interesting solution to this. Third, it doesn’t matter how good you are, this can happen to you. The odds of getting caught in a process-resolution trap increase exponentially with complexity. Be aware during design / architecture phases, the decisions made today will limit future options. There’s a side order of art included with the science here. Balance is the key. The VPC downloads listed above will expire on November 1, 2007, which is earlier than anticipated. It is important that you backup or move any data to a new location before that date. To move Team Foundation Server data, see Moving Team Foundation Server. New VPC images will be posted as soon as they are available. The original expiration date was 15 Mar 2008. Jeff Beehler announces the availability of updated Team Foundation Server 2008 and Team Suite Beta 2 VPC images. Good work Jeff and team!